Sectigo (Formerly Comodo) has emerged as the largest CA in the World. It provides a wide range of SSL certificates with different levels of validation, warranties and other features. Sectigo is a company which has been built on the foundation of trust and believes that each digital transaction must have an in-built layer of trust and security. Sectigo offers a wide range of products suitable for all types of online businesses i.e from Small to Big Enterprises. It offers all types of SSL i.e Extended validated, Organization validated, Domain validated SSL Certificate at affordable prices. Comodo SSL Certificates offer the quickest and most cost-effective route to website security. 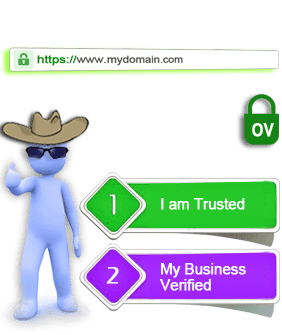 Verified business authentication SSL certificate, issued within 2-3 business days. Shows the padlock sign in all web browsers. Great data privacy with up to 256-bit encryption. Increased consumer trust as compared to a domain validated SSL certificate. Organization Validation SSL certificates are now the defacto SSL standard. 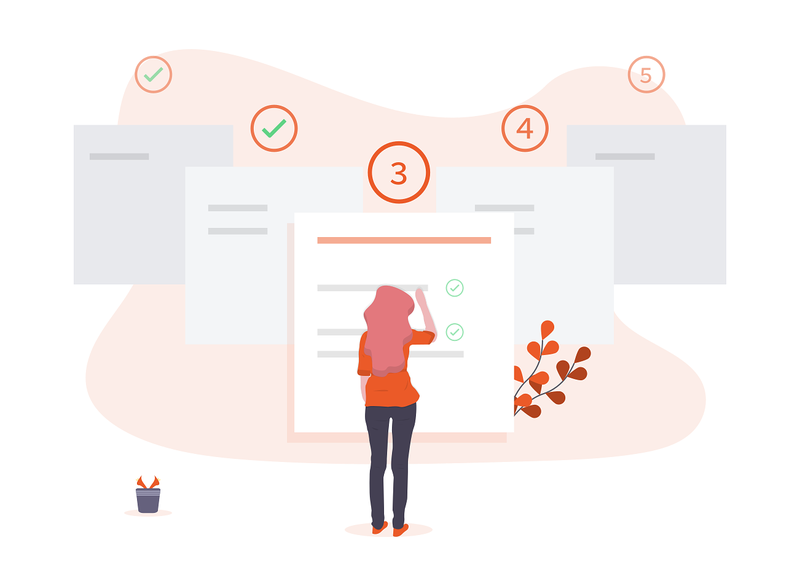 Benefit with an improved ranking signal in Google search and a host of other value-added features which put you in the winning league online. Only domain name email authentication. 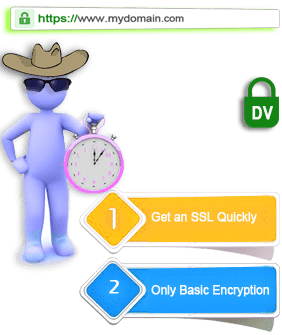 SSL certificate can be issued in minutes. Lowest consumer trust as compared to an organization or an extended validation SSL certificate. Domain validated SSL certificates are good for static content websites which only seek encryption. Get your business name in the browsers address bar, re-inforcing customer confidence in your brand. The green bar is associated as the sign of ultimate trust on the internet with a positive signal in all web browsers. Great data privacy with up to 256-bit encryption for all purchases. 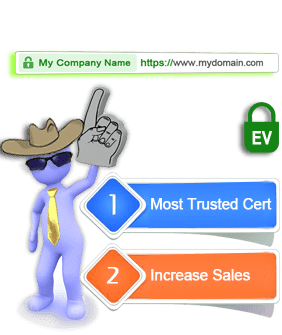 Increase sales dramatically and generate a great return on your EV SSL cert investment. Extended Validation SSL certificates are every online seller's best friend. A benefit with an improved ranking signal in Google search and a host of other value-added features which put your e-commerce business in the winning league. 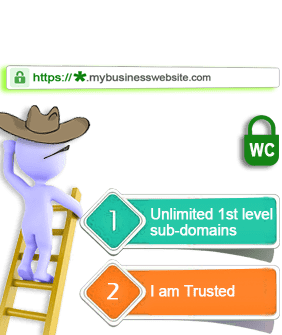 Secure any number of first level sub-domains with a single certificate. Available in DV and OV validation options. Wildcard SSL certificates ensure a lower cost of ownership across the online space. 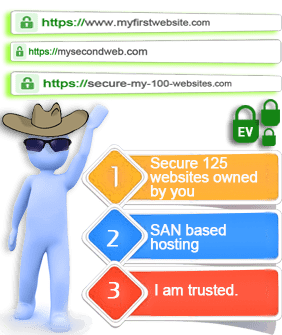 A multi-domain SSL certificate for specialized hosting situations. Also known as a unified communications SSL certificate. Get up to 100 SAN names added and secure multiple websites with one certificate. Available only in DV & OV validation. Multi-domain SSL certificates are useful in shared hosting environments. authenticates the publisher of the downloadable software. Shrink wraps the software making it tamper proof. Code Signing is mandated by Microsoft and other browsers. Automated daily scan ensures you are ahead of the game. 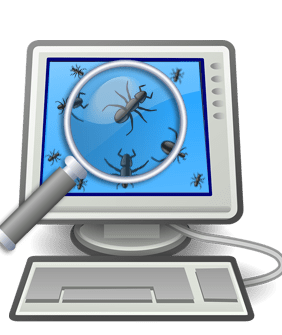 A scan can pinpoint code which is malware infected with remedies. Quick real-time alerts via email to inform you of infections. 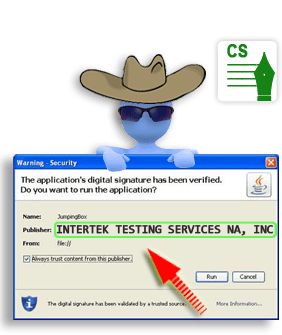 Do an on-demand additional scan after every code clean up to verify results. Take care of your website visitors by ensuring you are not unknowingly distributing malware via your website. We will help you determine the right type of SSL certificate. Ensure you get a great ROI by implementing SSL. Hanhold you in the selection via chat if required. Should you be ever confused in selecting the right SSL certificate, we are always on hand to help. No obligation fully functional free trial SSL certificate. Use it for 30 days in your production infrastructure to test SSL. Available in DV and OV validation options only Take a free SSL trial certificates to help website developers get conversant with SSL.